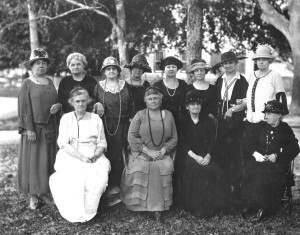 The Apalachicola Margaret Key Library’s roots go all the way back to 1896 when several prominent local women formed “The Woman’s Reading Club.” The club began purchasing books, and a member made her home available on Monday and Wednesday afternoons as a budding library. The first volume acquired was The Library of American Literature. The collection grew as the club raised funds to order books by Dickens as well as other novels, various histories, and books of poetry. Together with donated books, there were soon 80 volumes. In 1904, the club adopted the name of Philaco, comprised of “Phil” for love, “Ac” for bravery and the letter O for strength and dignity. Their book collection continued to grow, and in 1915 the Philaco Woman’s Club established a public library above the Methodist Church Sunday School room with 300 donated books plus a sum of money. Ladies of the Philaco Womans Club, 1930s. State Archives of Florida, Florida Memory. By 1923 there were 2,000 volumes, and the old City Hall plus $600 was donated to Philaco. The building was moved to the northeast corner of Battery Park, and the town’s first librarian was hired on a part time basis. Members volunteered their time as well, and the club maintained this building until 1944 when it was deeded to the city to be used as a youth center. A small pump house was moved from the Air Force base to Apalachicola to become the next library building. The Philaco Club continued to financially supported the operation, but as costs of utilities, landscaping and maintenance continued to mount, the city was given the deed to the library. The mid-to-late 1950s saw a resurgence of interest in establishing a new library that would better meet the community’s needs. City commissioners gave Philaco permission to spearhead the project of raising funds for a new building. In the early 1960s, the old building was sold, and a new library was constructed by the city with the help of government grants. The Philaco Club continued to be involved in fundraising and stewardship. In 1996, past Philaco president Margaret Key died, leaving a generous bequest to the Library. Her gift formed the core of funding for a new facility and combined with matching grants and other generous donations, a brand new library opened its doors to the public in October 2017. The new library was named the Apalachicola Margaret Key Library in her honor.